We Provide the Best Denture Treatment in New York! Missing teeth can cause serious detriments to your everyday life — from a lack of confidence to the inability to properly eat, speak, or even close your mouth. Fortunately for you, our expert team at Rockefeller Cosmetic Dentistry are dedicated to finding the perfect solution to restore your smile and get you back to living your life to the fullest! Partial Dentures are one of the oldest and most tried and true methods for restoring lost teeth is the application of dentures. Dentures are removable dental appliances that fit over your existing teeth and gums to restore missing teeth and mimic a fully healthy smile. Conventional — Remaining teeth are removed and a fully, removable denture is made and placed over your exposed gum after the tissue has healed (which could take several months). Immediate — During your first visit, your dentist will take measurements and build your denture, which will then be inserted during your next visit, on the same day as remaining teeth are pulled. You never have to go without teeth using this method, but the denture may need to be reconstructed after your jaw heals. Overdenture — Occasionally, your dentist will find it more beneficial to save some of your remaining teeth to provide structure, support, and stability for the denture. 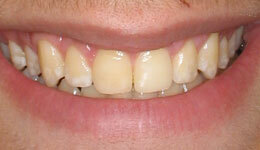 An overdenture is placed over a small number of natural remaining teeth after being prepared by your dentist. Restore ability to chew and talk. Although dentures were primarily designed to allow wearers to chew properly again, modern advancements in dentures have allowed for a more comfortable fit, making it easier for you to talk and chew as you normally would. Adaptable to the patient. With a wide variety of available dentures (from full to partial to overdenture), there is now a much larger versatility to denture applications. Now there are even implant-supported dentures that allow for a non-removable, comfortable denture placement. Improve your looks! 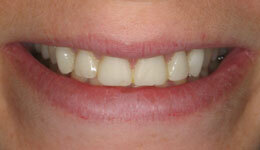 Now more than ever, denture technology allows for an intensely aesthetically pleasing restoration of your smile. Our state-of-the-art dentures come in natural porcelain and plastic models and a range of colors for your perfect smile! Affordable. Dentures are more affordable and cost-effective than other methods, especially when natural teeth are available. Extra care required. Without proper maintenance of your removable dentures, they are more prone to infections and diseases including halitosis (bad breath). Uncomfortable. Some cheaper dentures or those that are improperly fit can move around in the socket, causing pain and difficulty chewing and speaking. Requires adjustments. You have to get used to dentures, which can take a few weeks to restore normal chewing and talking abilities. 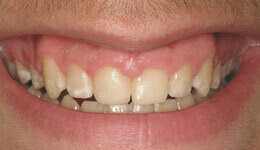 Dentures, as opposed to dental implants, provide structure and support to the jaw. 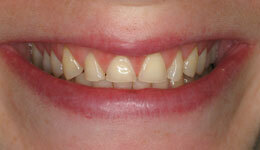 Therefore, those with weakened jaw bones and gums should generally choose dentures. Alternatively, if your jaw bone is strong, implants have a variety of advantages over dentures, namely that they’re easier to install, require less healing time, and can be less invasive to healthy remaining teeth. First, your dentist will evaluate the current state of your dental health, deciding on the best course of treatment. If the remaining teeth are unhealthy or can’t support a partial denture, your remaining teeth will be extracted to prepare for the placement of a full denture. The time that it takes your tooth sockets to heal varies depending on the quantity of teeth removed and your natural healing speed. An impression will then be made of your mouth to model the new dentures after. On your next appointment (or on the same day if you’re getting immediate dentures), you are able to pick your next set of teeth! With your dentist’s help to match the best shading and style of denture to your general aesthetic, you’ll find the right look and smile for you. Once you’ve decided (it’s good to get a second opinion from a friend or family member), your final dentures will be constructed. Your dentist will then try your new dentures in your mouth, where you’ll wear them until you next appointment. At your final appointment, your dentist will make adjustments to fit and placement, making the dentures as comfortable and painless as possible. Your dentures will then be placed and you can walk out of our Rockefeller office with your new, brighter smile! It may take a little bit of time to adjust to the feeling of dentures in your mouth. Time ranges from a few weeks to a few months as your muscles and mouth adjusts to a new, perfectly functioning set of teeth. Although it is not unusual to experience tenderness and slight pain, dentures heal relatively quickly, and eventually don’t feel any different than your pre-existing teeth. Also, just like regular teeth, your dentures require a good oral hygiene routine to remove excess plaque and food from them and prevent staining. Rinse your dentures before brushing them, making sure any loose food particles are clear of the surface. Brush with soft bristled toothbrush and a gentle cleaner to avoid scratching them. Clean your mouth thoroughly, including gums, tongue, and roof of your mouth. 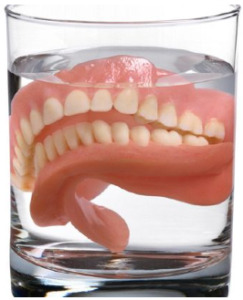 Always store dentures in water to avoid warping them. Always use adhesives exactly as directed on instructions. Ask your dentist for proper adhesives and cleansers. If you experience any prolonged discomfort from denture wear, consult your dentist at Rockefeller Cosmetic Dentistry immediately. Ready to start smiling again? Call us at (212) 581-1091 or visit our website to schedule your denture consultation today. We work with you and your dental insurance provider to help you get back to smiling with our affordable dentures. Call today so we can help you determine the best treatment to get your smile back.